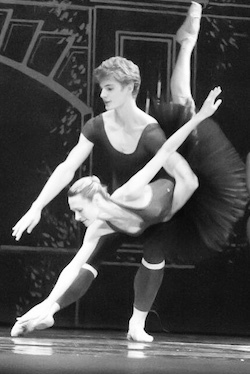 Towards the end of 2013 we published an article about an Australian dancer raising funds for her second cancer treatment. 18 months on, we caught up with the courageous young artist, and found she couldn’t be happier. An old friend from Australia had invited Lily to stay and take class with the Slovakian National Ballet. Despite having been flat on her back for six hours a day having immunepheresis – a treatment for cancer – she took the challenge, and was rewarded in more ways than one. Lily Bones as Aurora in ‘Sleeping Beauty’. Photo courtesy of Bones. Since we chatted to Lily in 2013, she raised 30,000 Euro (AUD 45,000) over three months for her treatment at Lentz. The medical bills exceeded estimations by 14,000 Euro. Besides crucial contributions from friends and family, she used online crowd-funding and five major offline events, including gala performances, auctions and a Zumbathon. She says she is eternally grateful to everyone who had a hand in helping to organising the fundraisers, in particular noting Verve Studios, who organised the highly successful auction, and Yumiko leotards who made “a huge donation”. Lily was first diagnosed with cancer in 2011, despite having been told by five different doctors that the breast lump she had discovered two years prior was benign. Following two masectomies, she was given the “all-clear”, but two years later the same cancer had spread to her lymphnodes. Since her check-ups of February 2014, Lily has been confirmed NED; no evidence of disease, but she continues to have scans and blood tests. She is now dancing full days with no symptoms or decrease in energy – although she says this is not necessarily an indicator of wellness. Having previously been misdiagnosed, Lily is “paranoid with good reason” and continues to stay on top of her health. However, she has been told there is only a very small chance the cancer will return. Her surgeon has been positive about her starting a family, which is now one of Lily’s goals, besides continuing dancing and developing dancers. Of course, there is also a long list of people who Lily credits, for their practical, financial and emotional support, calling them “angels with kind words in the right moment.” She is now working on an E-book called Dancing With Breast Cancer, which she plans to give to everyone who helped her. Lily Bones with husband Jan Gonscak. Photo courtesy of Bones. Lily continues her quest to help raise awareness and funds for breast cancer research, and has so far danced for two benefit galas for cancer resource centres. “I enjoy standing on my head in front of oncologists who would expect that I would not be able to do that – and then presenting them with the contradiction that I am a two-time breast cancer survivor.” She invites readers to message her via her Facebook page to request a performance for any future cancer fundraisers. 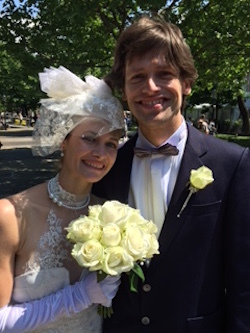 In the last months, Lily married the “tall handsome man”, Jan Gonscak, Slovakia’s leading independent dance artist. And a few weeks later came more happy news, as she was offered a place in the Slovakian National Ballet!